In its pursuit of attaining its goals to promote Entrepreneurship and Professionalism, WZCC’s venue for this year’s Global Meet was Hong Kong – strategically located at the mouth of the Pearl River Delta in Southern China, with its lush green hill slopes, secluded beaches, leisurely rural landscape and rocky shoreline. The Global Meet was held from Friday,16 to Sunday 18, December 2016 and was attended by not only the Global Zarathushtis but also the Zarathushti diaspora from Hong Kong. 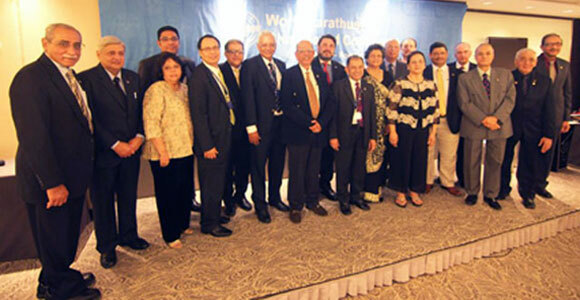 The gathering was indeed of an International flavor.This was the first time a major Global Zoroastrian event was held in Hong Kong. The Event was a great success and this was only possible because WZCC received tremendous support from the Hong Kong Anjuman led by its President, Mr. Neville Shroff, his wife Farida and his team of Trustees – Ms Dilnavaz Daver, Mr. Viraf Parekh, Mr. Rustom Jokhi and Mr. Homiar Poonawalla and of course, the Hong Kong Zoroastrian Community. The proceedings started on Friday 16, with a Pre-AGM meeting at the Zoroastrian Building followed by dinner hosted by the Hong Kong Anjuman. Mr.Sam Balsara and Mr. Mickey Mehta graced the evening with interesting words of wisdom. Please consider becoming a member by visiting www.wzcc.net or contacting your Region Director/Chapter Chair.